Viseart Apricotine Petit Pro Palette ($30) is a new mini eyeshadow palette featuring eight eyeshadows in delicious peachy and bronze shades that launched for Spring 2019. You know, when you run across palettes like the Viseart Petit Pro Palette and you start using them you really have to question your sanity. I’ve spent plenty of money on a variety of different Too Faced Eyeshadow Palettes peach in theme that had more eyeshadows and were a bit more expensive in price but I’d much rather just sit and play with the Viseart Apricotine Petit Pro Palette because the quality just superior. Viseart Apricotine Petit Pro Palette does so please and it won’t break your bank account. Viseart Apricotine Petit Pro Palette is a slim flip open palette that’s the size of a credit card and holds 0.28 oz total eyeshadows. The palette is cute, super easy to store, and amazingly lightweight for travel. If you’re going on a Spring Break vacay all you really need is this palette to create some warm looks. You get four mattes and four shimmers all of which were pigmented with a soft, buttery texture and absolutely no fall out. I struggled with one shade which was Grenadine. It was a little bit of a pain to apply as I kept having to layer it on since it sheered out during the blending processing but none the less it was still a really nice shade to work with and easy enough to apply. They wear really well without fading or creasing on my drier lids. The colors just remain so fresh and vibrant throughout the wear! The palette does not offer anything new sadly. These are shades you likely own ten times over. However, the quality is spot on and that’s what you might want to consider buying into. As I said above, why own numerous peach palettes with 10 + shades that have a so so formula when you can own one small palette with a superior formula. It’s a good pick if you don’t already own a ton of peach shades as this covers a rather good range of peachy shades. For a tiny palette the Viseart Apricotine Petit Pro Palette packs a mighty punch with brilliantly formulated shades! Viseart Apricotine Petit Pro Palette is a $30 travel-friendly palette with a selection of eight eyeshadows. 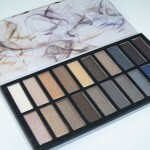 You get four mattes and four shimmers all of which were pigmented, easy to apply, and blend. I had no issues with fall out and colors remained vibrant without creasing on my drier eyes. Beautiful selection of peach and bronze shades. Pigmented, easy to apply, and blend with a soft, silky texture. Lacks unusual or unique shades. Viseart Apricotine Petit Pro Palette is an ideal pick for anyone that values a beautifully formulated eyeshadow formula! Very nice. I keep thinking that the old Vice palettes have dupes for virtually everything new, or close enough. Noticed in Ulta yesterday that Flesh has a take on the Viseart Liaison, which surprised me greatly. Get the Soleil, too, as well as CP Disney Villains. We need to see those! Good job. I have it will be reviewing that one shortly. It’s a lot more colorful compared to this. Made in the USA. And Isabella won’t mind, if you Check Christine’s review (Temptalia.). I really like it, but have resisted thus far. Possibly more colorful (and bright), but far less varied, than Riviera. Can’t wait to see it on you, Isabella. You must have had a tad of trepidation, but it’ll look great! Awww, you look so pretty in peach! And we buy despite not needing to because it’s just plain fun to buy. Haha! aw thanks <3! Exactly LOL! Ooo, the color story reminds me of a lot of KBeauty looks I see on IG. Looks lovely as a basic palette for a beginner! too true! Peachy palettes are so big in kbeauty!